The Food Alphabet and More: Katsufor200 at Yabu PowerPlant mall this October 20th! 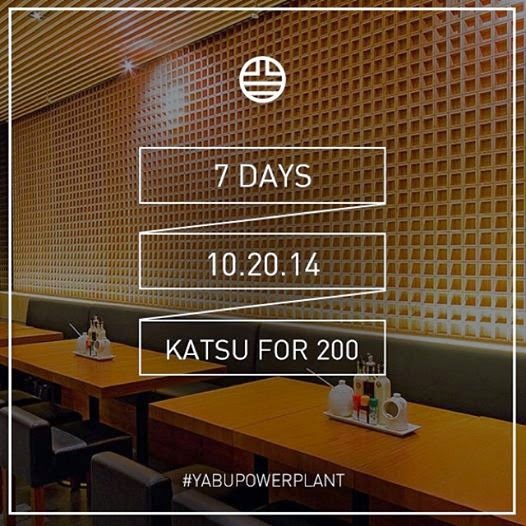 Katsufor200 at Yabu PowerPlant mall this October 20th! Katsu for 200 is coming! Are you ready! Don't know what it's all about? All I can say is where have you been all your life! What you need to know about KatsuFor200? The doors to Rockwell will open at 11AM. Line up as early as you can. Yabu will start counting the first 200 on the line outside the Yabu store in Rockwell, Guards and directional signages are there to guide you. Only 200 people will be allowed to line up. Guard your line. This is to prevent people from cutting in. Please be reminded that we only have seats for 70 people, the rest of the participants will need to remain in line until there are available seats for you. Tables will be shared between different groups. There will be no takeout of leftovers, no side orders or desserts. Refreshments will be served while you wait. Starbucks Philippines 2015 Planners are here!!! Getting ready for the holidays with Hunt's! My Lucky Mc Donald's Drive-Thru Day!!! Wang Fu Dimsum All-you-can Anniversary Treat!! !